The other day my father posted this quote from Marilyn Monroe randomly on my FaceBook feed. It was the perfect quote to sum up my outlook on life. At first I was unsure why he'd posted it. Now I know that he "gets me" and is proud of the way I live my life. 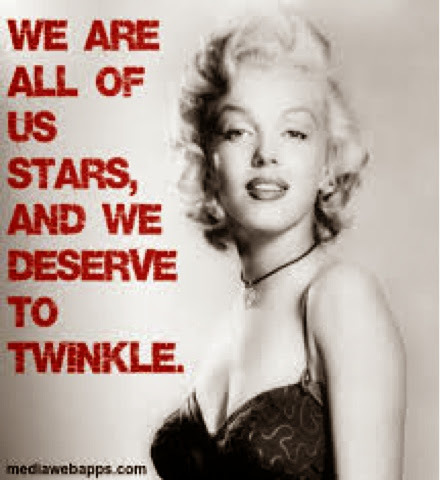 Not being a life long Marilyn follower, I didn't even know that this quote was out there. Before the movie, "My Week With Marilyn", I knew as much as anyone else did. It's hard to believe that such an internally tortured woman could have such an amazing outlook. Perhaps she was just ahead of her time. Reflecting on that quote my Dad sent, I searched for other Marilyn musings and wanted to share the ones that I could have written myself. 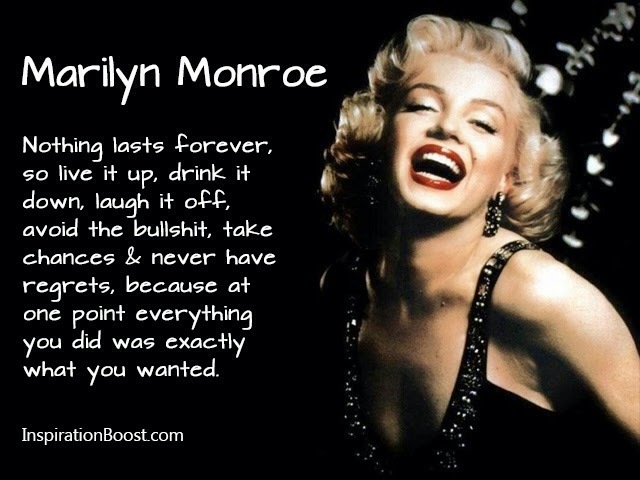 Marilyn and I are practically the same person, yeah right. Well, minus the voluptuous and ridiculously beautiful part. Along with the mind numbing sadness too; that we do not have in common. "No one ever told me I was pretty when I was a little girl. All little girls should be told they're pretty, even if they aren't." Women are tough on each other. They always have been and always will be. Building our daughters up by telling them that they are beautiful especially when they do something kind can help them build their inner beauty. It can radiate out of girls of all shapes and sizes if it's nurtured. Though I was the one of my dearest friends with the personality instead of the looks, feeling pretty is still important. I am sure I was told I was pretty when I was little. Can you imagine how it would feel to never hear it? "I've found men are less likely to let petty things annoy them." This is so true. It may also be the reason I like sports. The more things you can talk about that aren't petty means the less things you get involved in that are petty. Many women can learn a thing or two from men where this is concerned. Being petty means that you might have too much time on your hands. Fill it with something that is more interesting and drama will leave your life. The only problem here is being confused about which instinct is the right one to follow. What she's really saying here is be true to yourself. Don't let others influence what you should feel to be right for yourself. Girls that grow up using their heads more than their hearts will have an easier time when it's time to fully give their heart to someone. My right shoes are my hikers. High heels and I don't get along, like they did with Marilyn. When those beautiful Merrells go on my feet and I am facing a mountain, the powerful feeling keeps growing with every step. Standing on top of a higher elevation than the last feels like I rule the world. "Fear is stupid. So are regrets." You only get one shot at this. Work hard, so that you can play hard. Do something every day that scares you. One day you'll be wrinkly and gray and nothing will scare you anymore. "A man makes you feel important - makes you glad you're a woman." This has to be the right man, of course. Marilyn had pretty bad luck in that department. The sun was shining on me the day I met my husband and I've needed good sunglasses ever since. He remains to be the peanut butter to my jelly, the cheese to my macaroni, and the onion dip to my pretzel. "Friends accept you the way you are." Having life long friends is a blessing. These people are the ones that I'd have to kill if they weren't still my friends. They know everything about me and they still like me anyway. We don't live near each other, yet whenever we pick up the phone it's like we just left each other's side. Surely there are more of Marilyn's words that could have been included. She was a wise person even as a sad and flawed one. What she lacked was true happiness. Those of you who have it, don't let it go. Those of you who want it, start finding it today by following her words. Be glamorous my lovelies!